WebDAV is a popular protocol for online storage. You can use ExpanDrive to connect to a WebDAV server using either HTTP or HTTPs. Mutual TLS with client certificate is also supported. From the ExpanDrive window click on Add. Click on WebDAV. 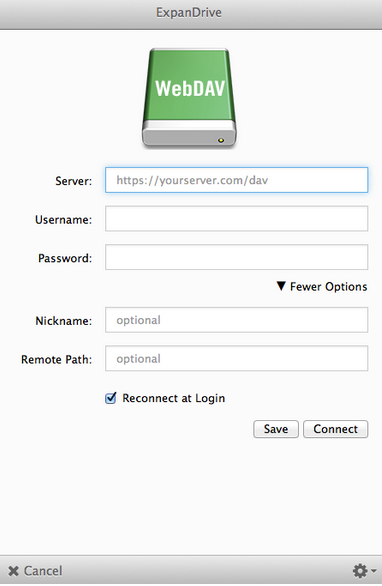 The WebDAV configuration screen is displayed. Configure the fields, as described in the table below. server Enter the complete URI of the WebDAV server. username Username that you use to connect to the server. password Password that you use to connect to the server. nickname An optional nickname that you provide to identify this server. remote path An optional remote path that you specify, if you would like to map to a specific directory on the FTP server.